I was looking for something to make for a co-worker in traditional Spartan green and white, when I found a diagram for a Russian Kusudama Superball (Кусудама супершар оригами). I am unable to re-find the link now, but I am certain a youtube or google search would find a similar diagram. 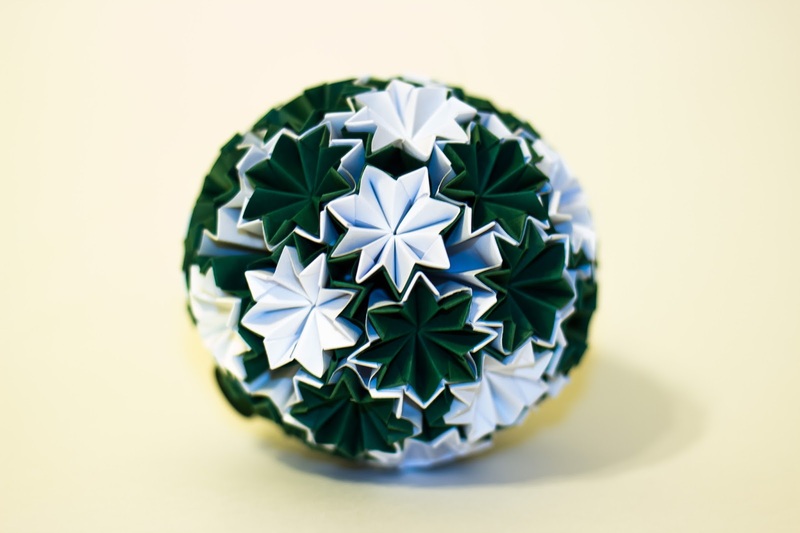 I have also seen similar units in a Japanese Kusudama book by Kubo Mariko. I used inexpensive origami paper and printer paper when I ran out of white origami paper. If you look closely you can see the difference of shades in the white. I used two layers in each unit. The layers lock together pretty well, so I only used glue (Elmer's) to connect units together.